Studies have revealed that many essential oils have powerful antibacterial properties. With resistance to antibiotics on the increase, researchers are trying to find alternatives in nature and various essential oils hold a great deal of promise. Essential oils have far fewer side effects than synthetic medications. According to research, cinnamon essential oil is the most effective antibacterial oil of all but it is closely followed by various other oils including tea tree oil, thyme oil, and oregano. Studies show that essential oils are effective against several strains of Staphylococcus aureus. 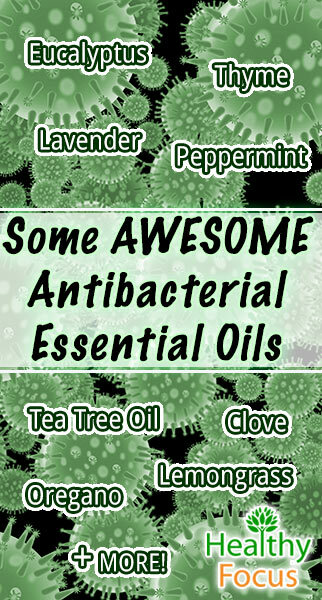 Studies also show that certain essential oils can combat E.Coli and candida infections. 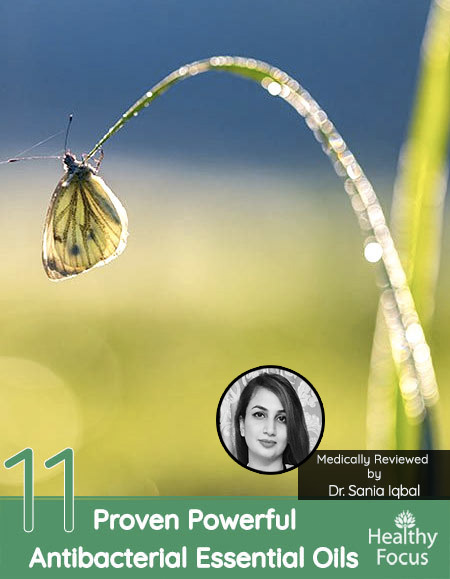 This powerful disinfecting essential oil is native to Australia and has long been used for medicinal purposes due to its reputation as being a germicide. This germicidal quality makes it an antiseptic, which means it is suitable to treat wounds, burns, cuts, ulcers, sores, and abrasions. When treating a wound, eucalyptus oil expedites the healing process while protecting it from exposure to air and antimicrobial activity. For this reason, eucalyptus essential oil is often used in skin care products because it helps fight skin infections and soaps. Eucalyptus is a common ingredient found in dental hygiene products for its ability to fight cavities, plaque, and gingivitis. 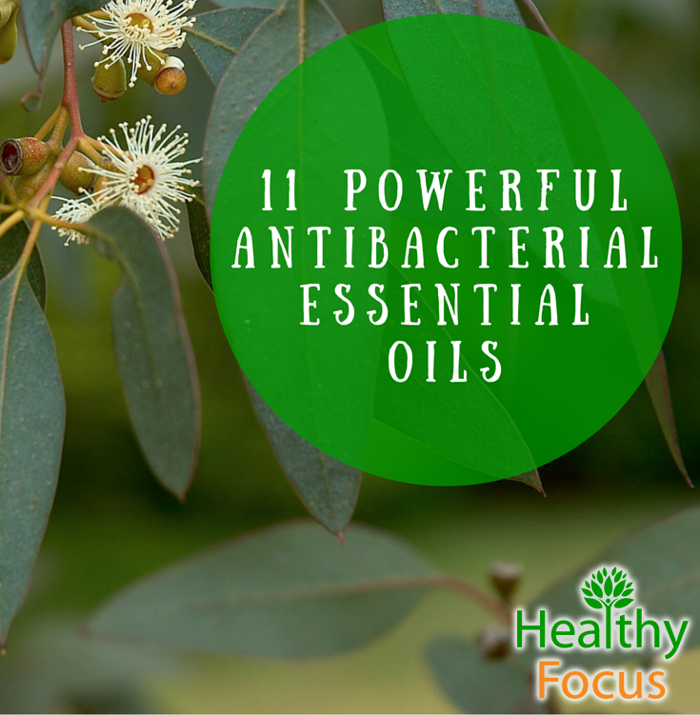 Eucalyptus’s powerful antibacterial properties also extend itself to your home, this essential oil is often found in soaps, detergents, and household cleaners. Diffuse this essential oil in a vaporizer if you want a fresh smelling home free of roaming bacteria and germs. This cooling, uplifting essential oil is famous for its antibacterial activity and antiviral properties. Native to Europe and widely used for its bright effervescent flavor, peppermint essential oil has also been widely used for its medicinal properties. This soothing essential oil elicits feelings of tranquility and calm, often lulling you to sleep. However, do not mistake lavender for being just a pretty smelling oil. The name lavender is derived from the Latin name Lavare, which means to wash. This essential oil is a powerful antibacterial that can boost your immunity. Regularly using lavender essential oil can help provide resistance to a number of diseases and viruses. Due to its antibacterial, and antiseptic properties, lavender essential oil is considered effective in treating various skin conditions as acne, psoriasis, and other inflammatory conditions of the skin. Tea Tree oil is one of the few antibacterial, antiviral, and antimicrobial essential oils that you can apply directly to the skin without first diluting it with a carrier oil. This medicinal oil is widely used to treat skin infections such as acne, eczema, warts, and psoriasis. Based on these and other studies, it seems that such a natural and inexpensive fix could be a huge boost for hospitals battling to prevent the spread of MRSA which has become so common and difficult to treat within the hospital and nursing care settings. This sunny citrus essential oil delights with its citrus scent and its magnificent antibacterial properties. Although it is native to South East Asia, its medicinal and cosmetic potential was fully realized in Italy. Lemon has a rich history of being used in antibacterial cleansers, however, lemongrass, its sister oil is gentler, sweeter, and less sour. However, do not be deceived by its reserved scent as it still functions as a powerful antibacterial essential oil. The antimicrobial properties of this oil inhibit the growth of bacteria internally and externally of the body. It helps to fight such bacterial infections as urinary tract infections, malaria, typhoid, food poisoning, body odor, and various skin conditions. Oregano is not just a spice used to add flavor to your Italian dish, in fact, it’s a ruthless germ killer and provides wonderful immune support. Oregano essential oil has been found to protect from many strains of bacteria such as E. coli, Staphylococcus, and salmonella. Thyme is very powerful and also potentially very irritating to the skin. Thyme essential oil should always be diluted with a carrier oil before topical application on the skin. It is also recommended to test a small area to make sure to avoid irritation and potential allergic reactions. Clove bud essential oil has strong antimicrobial and anti-fungal characteristics. Clove was the second best inhibitor in a test of 21 essential oils tested against common bacteria including E Coli and K. pneumoniae (Cinnamon was #1). I have grouped these two essential oils together because of a recent study which found that they could inhibit the spread and growth of some 60 different strains of Escherichia coli (E.coli). The study published in August 2013 set out to examine these oils as an alternative treatment to deal with multi-drug resistant bacterial strains. We saved the best for last. Cinnamon Essential Oil has good research showing it to be potentially one of the strongest antibacterial essential oils. This list of oils is far from complete. Patchouli, lavender, lemon, grapefruit, and sage are other oils with proven ability to fight certain antibiotic-resistant bacteria strains (2). Once you have chosen your antibacterial essential oil or oils there are a number of ways that you can use them depending on the illness and bacteria that you are trying to treat. I will note here that there are many ‘antibacterial recipes’ that call for the internal use of essential oils but we can not recommend using essential oils internally unless you are under the supervision of your doctor. All of the antibacterial oils mentioned in the article can be inhaled directly from the bottle or via a diffuser. If you are trying to get rid of a respiratory infection, then you can add a few drops of your chosen essential oil to a bowl of hot water or the sink, cover your head and shoulders and inhale deeply. Combine a few drops of your chosen oil or oils with a carrier oil like coconut or jojoba and apply the oil to the affected area of your body. Massaging the oil into your abdomen is also a great way to help fight internal infections. You can also apply some diluted essential oils to help treat common skin infections like acne or even warts. Certain oils like clove and thyme are excellent for relieving oral pain and killing bacterial infections in the gums. Add a few drops to a glass of water and use the oil as a mouthwash being careful not to swallow any. Alternatively, you can add some of the oil to a cotton ball and apply it to the affected part of your mouth. Add 6 to 8 drops of your antibacterial essential oil to the bathtub. Lay back, relax and let the soothing, healing properties of the oil wash over you. With the massive oversubscription of antibiotics, bacteria are becoming increasingly resistant to conventional treatments. Essential oils offer a wonderful, natural alternative and hold a lot of promise. Numerous studies show that certain essential oils are effective against some of the most common and deadly strains of bacteria. We recommend however that you always consult your doctor before using essential oils instead of your prescription medications.